To test marmalade for doneness, drop a small spoonful onto the chilled plate, wait about 5 seconds, then run your finger through center of marmalade. When it?? ?s thick enough, the line made by your finger should remain clear. If the marmalade holds its shape, remove from pot the stove and proceed to next step. If the marmalade runs back together, continue to cook, return the plate to the freezer, and check again in a few minutes. 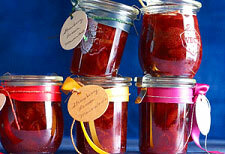 Ladle into jars, seal tightly, and cool to room temperature. Keeps for up to 3 weeks refrigerated. Note: For the best results, choose strawberries that have been frozen without added sugar or syrup.